The double release of waves 19 and 20 this month has meant a bumper Christmas for UK Attack Wing players. 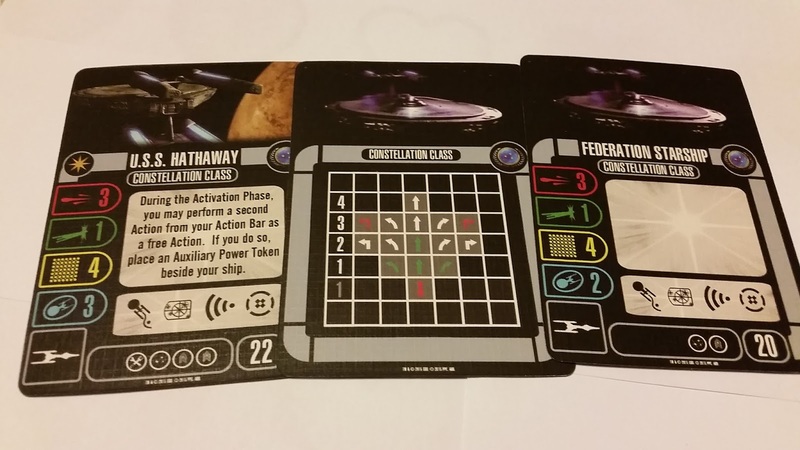 Wave 20 has given us a second Federation and Romulan addition but we've also dropped in a new Delta Quadrant ship too. First to the USS Hathaway. A Constellation Class ship featured in the penultimate second season The Next Generation episode, Peak Performance, its crew is made up of very familiar faces and it makes a nice "companion" ship to the recently released Ferengi Marauder Kreechta which was also in the same story. Worth 22 points, the Hathaway has the standard Evade, Target Lock, Scan and Battle Stations actions along with slots for one Tech, one Weapon and two Crew upgrades. Stats-wise there's a good three in attack, a single dice for defence, four hull points and three shield points. As way of a unique action, the ship lets you perform a free action from the four listed but it does incur the usual Auxiliary Power Token. The model itself is, frankly, a let down. It's a teeny little ship and I would have hoped for something a little bigger seeing as there are other not-so large ships that have decent sized miniatures. The paintwork is ok here and not that all-encompassing silver that seems to find its way on to all the Federation ships of recent months. Topping out at a speed of four, the Hathaway has every option available at speeds two and three, only forward and left and right banks at one and a single straight reverse which is unusual for a Federation ship. Both that reverse and the hard port and starboard at three are red. 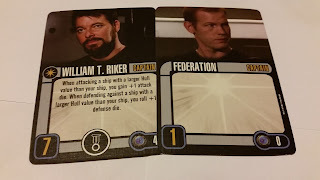 Keeping in line with the episode, William T Riker is your new captain option and is a decent addition as he provides an extra boost to those underpowered starships in the game. When attacking or defending against a ship with a greater hull value than yourself, Riker adds an extra die to your roll. He's also bearing a respectable skill of seven and an average cost of four. Definitely a strong option to consider on those 20(ish) point starships. 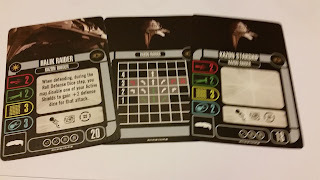 Riker also provides a slot for an Elite Action and in the case of this expansion Improvise which lets your cowboy your ship to better an attack. Disable the card plus any number of upgrades to re-roll that amount of dice for attack or defence. Note that there's no maximum set (one or two) so this could be very useful on higher powered ships in your fleet. Having no limit could be a game-changing ability too and costs five points to apply. Ok, to your trio of new crew and first up we have Geordi offering a cost reduction for all your Tech upgrades off the bat. Disabling the card also allows the addition of up to two die to your defence role determined by how many Tech upgrades you choose to disable. Now with Improvise as well this gives you a lot of opportunity to boost your defences on a ship that, here, only has a single die for defence. 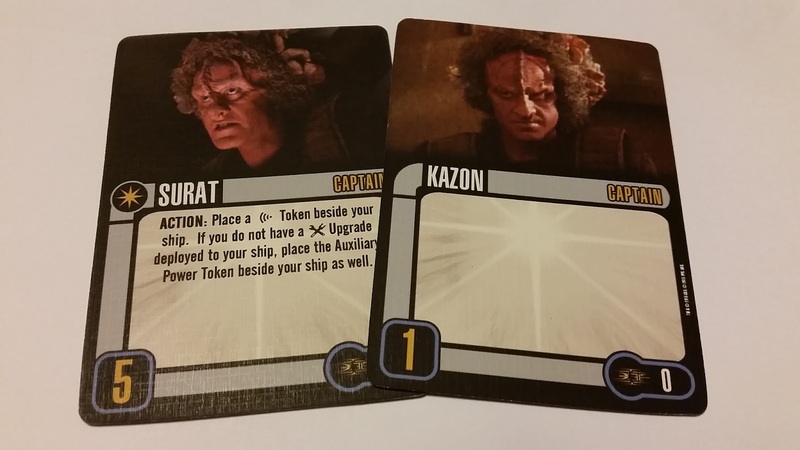 Why there are two very similar cards is a bit odd since you're more likely to take Improvise over La Forge. For the second time in as many waves we have another Worf. This time an early version of the character costing five points. 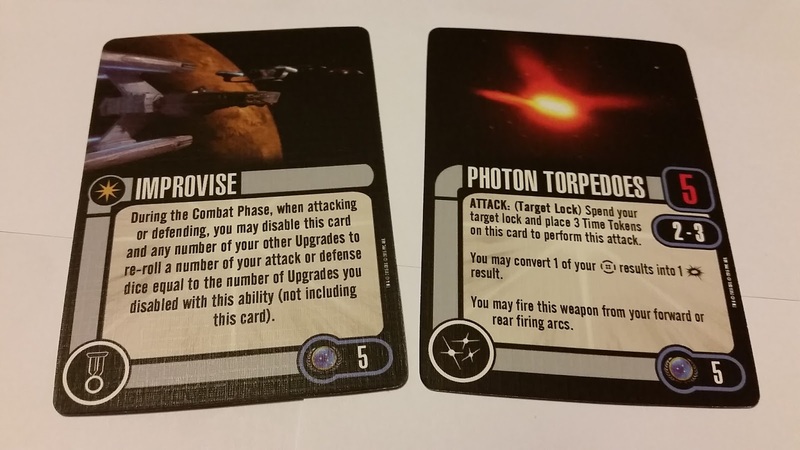 Again a defensive option, Worf forces your opponent to roll one less attack die and cannot spend any Battle Station or Target Lock tokens as part of the offensive. If the attacker has the Scan token and wants to use it against you they won't be able to either meaning you can roll your full defence. Nice to have this as a disable rather than a discard as I can see a lot of mileage in its operation if you're facing someone who likes to take full advantage of their Action Bar. As with the crew of the Hathaway that Riker picked in the episode, we also have (and I think this is a first) Wesley Crusher. Now we've seen cards giving his sort of action before but in this case there are a lot better specifics over what and how this card operates whereas in previous instances there's been some "give" in terms of interpretation (see Cryogenic Stasis on the T'ong for instance). 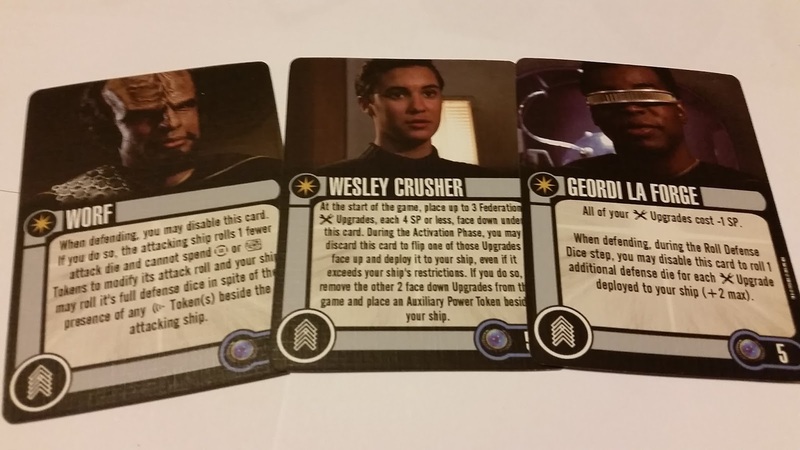 With Wesley you can choose up to three Federation Tech upgrades at the start of the game, each with a cost of four points or less and stick them under this card. 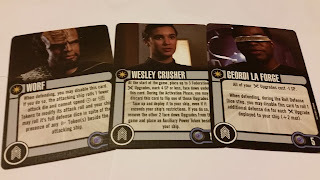 To use one of the three during the game you discard the Wesley Crusher card and can deploy the feature even if it exceeds your ship's restrictions. You can only use one of the three you originally pick therefore but this gives you a lot of flexibility during the game to adapt to the way events are going. I like the fact that this is very specific over how it operates and that it's four points max per card not four points in total. I'll apply this rule elsewhere. 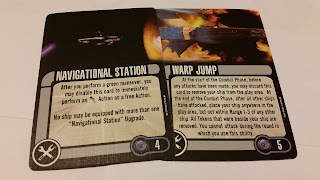 This expansion does feel a bit tired and Warp Jump could have added a lot more, perhaps even allowing your ship to appear at two points at the same time with some kind of game mechanic that an opponent firing on it has a 50/50 chance of hitting the "right" version. I'd have liked to have seen more jury-rigging and temporary upgrades perhaps with the Hathaway to reflect its mothballed/haggard nature in the exercise. The other huge shame is that the mission is a virtual duplicate of the one from the Kreechta Ferengi vessel which appeared in Peak Performance. It is more precise on using the Enterprise-D with Picard in command as your second Starfleet ship but other than that it's the same premise even down to the inability to use weapons against the Ferengi for five rounds. Lost chance to do something outside the box but it keeps the pack specific to an episode and a ship and I can see why they've chosen that route. 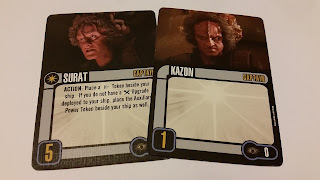 Second for unboxing is the Kazon-Halik Raider. 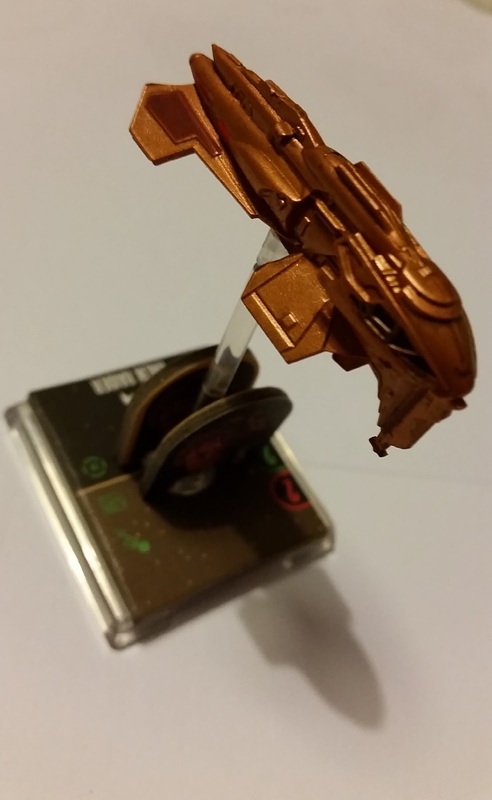 Honestly I don't know how much use this is going to see as it's currently my lone Kazon ship and it's not classed as an Independent which is my preferred faction at the moment. It's a nippy little craft with exactly the same moves set as the Hathaway except that it also carries the come about 180 turn at speed three. In the case of the model it's pretty decent and still one of the few small versions of the Raider available since Eaglemoss have yet to add it to their official line-up. The stats are fairly flat across the board with two in defence and attack with three for both hull and shield totals. You can upgrade her with two Weapon and two Crew slots with Evade, Target Lock and Battle Stations as your Action Bar options for a squadron point total of 20 points. Seems pretty reasonable for the flat stats which gives you a little of everything in all areas for once. For reference the generic version of the Raider costs 18 points and loses a Weapon slot plus one shield. Also in line with the Hathaway there's one captain expansion plus the usual in-box generic zero cost/one point skill. Surat costs three points and levels out with a Captain Skill of five. Given that the Raider only has three features in its Action Bar it's no real shocker that he lets you use the Scan token although there's a twist that it will mean receiving an Auxiliary Power Token if your ship doesn't have a Tech upgrade onboard. Notably Surat doesn't have the Elite Action emblem and in line with that there isn't an Elite Action card here... Although seeing as other packs have had tech slots and no tech cards that's not saying a lot. 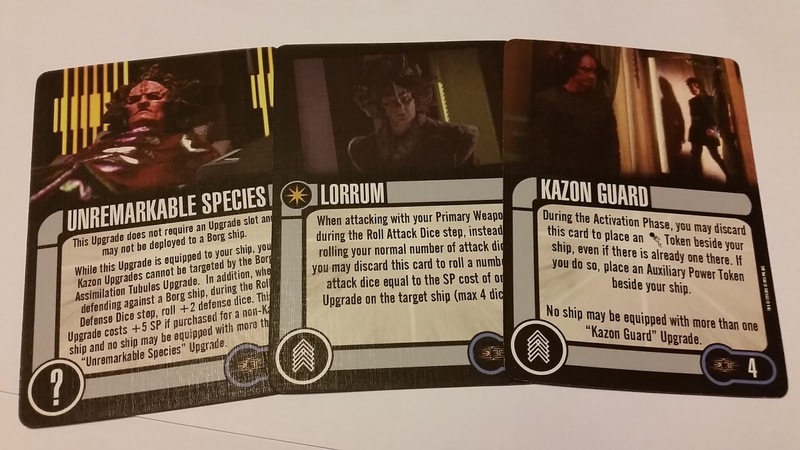 For crew you get Kazon Guard and Lorrum with both costing four points. 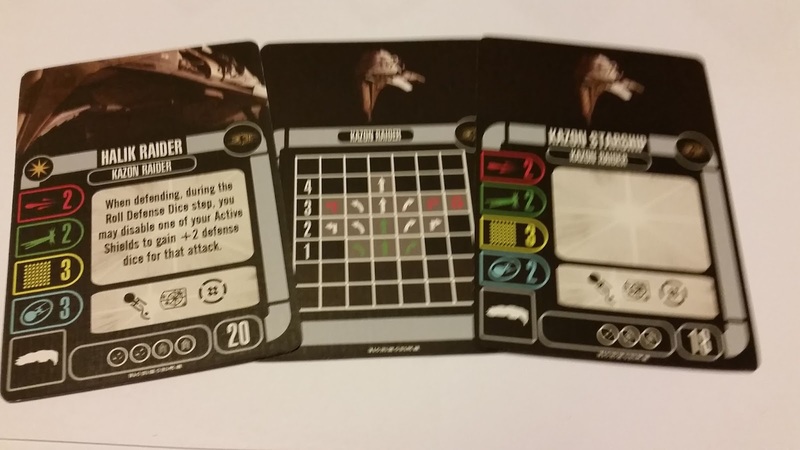 Kazon Guard lets you drop an Evade even if there's one already assigned to your ship. No ship can carry two of these and it is a one-shot discard. 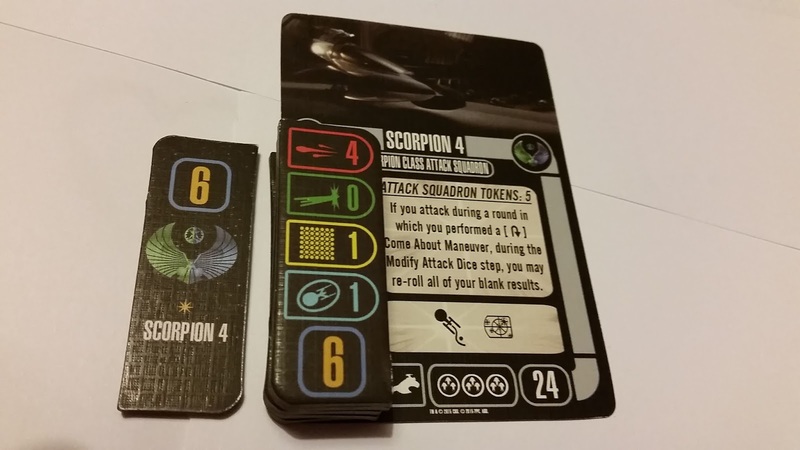 Pretty standard action there while Lorrum takes a brilliant spin on your main attack letting you roll a number of attack dice equivalent to the Squadron Points of one upgrade on the target ship (maximum of four). and you will have to discard the card. A decent chance to double the power of your primary weapon but a shame it's not reusable under the Time Token ruling. A trio of weapon upgrades come with the Raider. Costing three points is Aft Torpedo Launcher. 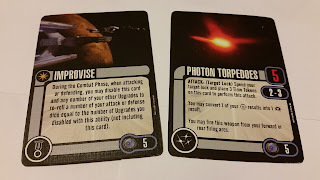 In comparison to a standard torpedo it's not as powerful, only using four attack dice and doesn't provide conversion of Battle Stations to damage and in the case of the Kazon version it can't be fired from your forward firing arc. It emphasises the lesser technology of the Kazon against the other Delta Quadrant races and the Federation while still enhancing the ship's meagre offensive capabilities. 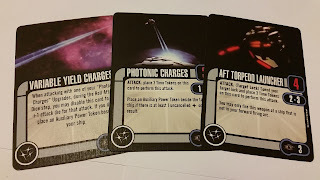 Taking some of those missing torpedo abilities is Photonic Charges. Using the Time Tokens feature it drops an Auxiliary Power Token onto the target as long as there's at least one uncancelled Damage or Critical Damage result left. Good that there's a little bonus off the extra attack dice used on the attack (three) at a reduced range of one or two. Plus it doesn't require a Target Lock to be used nor is it a discard or disable. Thirdly there's the low costing Variable Yield Charges. 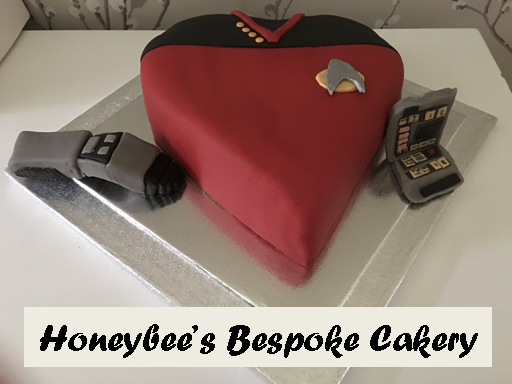 However with this one and in a similar vein the the Borg's Tractor Beam and Cutting Beam you'll need to have Photonic Charges aboard your ship. Variable Yield Charges is in itself an upgrade for that upgrade turning a three dice attack into a four dice offensive but it does incur the wrath of the Auxiliary Power Token. I like the concept of being able to build up features on your fleet. A few more of these "super bonus" upgrades in the future would be great and if they could be linked back to other features on older ships it might make some lesser bolt-ons more favoured. The final card from the pack uniquely doesn't use any of the upgrade slots available but gives a nod to a line of dialogue from Mortal Coil. Unremarkable Species makes the Kazon Borg-repellant. 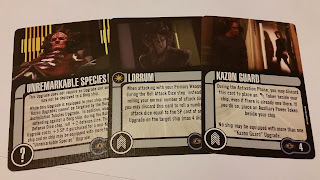 Assimiliation Tubules won't work on their upgrades and this feature allows the Kazon to roll two extra defence dice against the cybernetic lifeforms. At a cost of five points this is a must if you're choosing to face the Collective decked out in Kazon kit. I'm not sure who would actively choose to do this as I don't think in the long game it'll make that much difference to the outcome! The pack mission comes off the back of the second season cliffhanger Basics with the Halik Raider tasked with eliminating the Nistrum-controlled Federation starship and a Kazon raider before they in turn destroy the colony on Runara IV. For once it's not a direct line from the episode and takes into account a theoretical situation rather than retreading episodes or, more tragically as we've seen in recent packs, retreading scenarios we've already played. 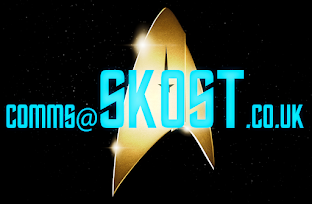 Might even convince me to purchase another Kazon ship and have a pop. 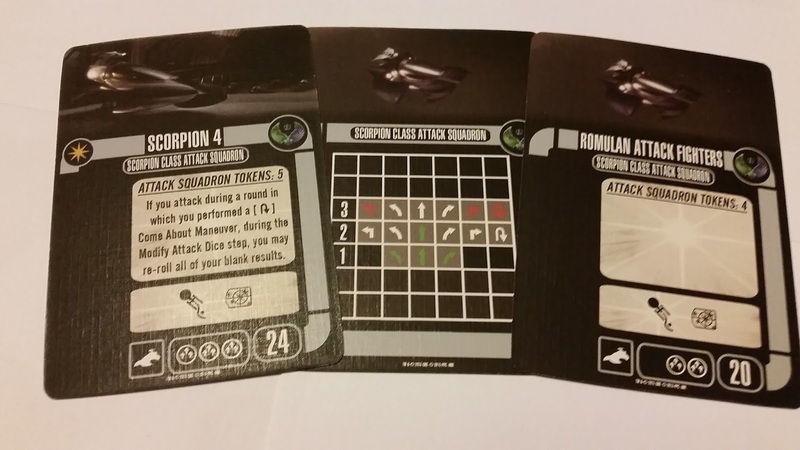 Last in Wave 20 and the third retail Fighter Wing after the Federation Attack Squadron and the Cardassian Hideki Fighters is the Romulan Scorpion 4 set. Based on the attack fighters from the Scimitar in Nemesis, the model is a three-pronged stand carrying three very small and barely recognisable ships that are, individually, even smaller than the Delta Flyer. There's no detail on these three mini-blobs but you can, if I'm honest, just make out their shape. Just wish they were a bit bigger - suppose we'll have to wait for Eaglemoss for that! So to the pack and for me this was my first fighter squadron. 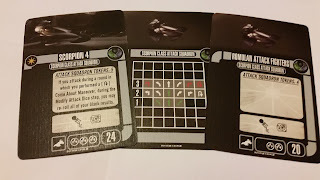 At 24 points it's mid-range but doesn't come with the usual set of Weapon, Tech and Crew upgrades. Instead it has its own set to choose from and you can pick a maximum of three. The fighters can only use the Target Lock and Evade actions as standard but they aren't to be discounted if you take a closer look. 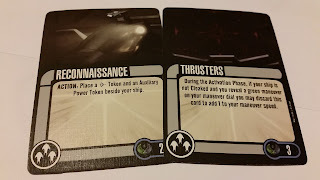 The other big differences to a "standard" starship are that they can only attack at ranges one and two and the way in which their stats are utilised in play changes as they take damage. Significantly the Captain Skill decreases as they take fire meaning you'll be moving earlier and shooting later (starts with a six). The Scorpion 4 squadron can re-roll all blank attack results if it's performed a Come About manoeuvre and there's not the touch of an Auxiliary Power Token to make it any less attractive. Talking of manoeuvres, the squadron can push a top speed of three with a full range of motions at two and three including Come About although at three it will drop an Auxiliary Power Token onto your ships. We'll take the upgrades in line with their costs starting with the two-pointer. 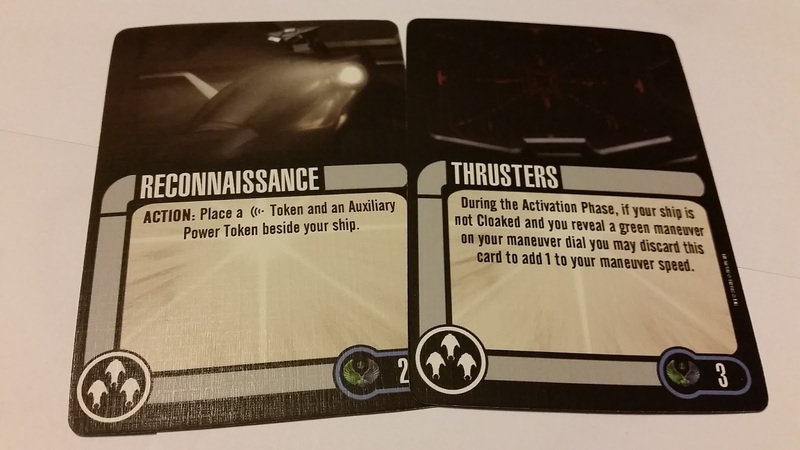 Reconnaissance lets you use the Scan action at the cost of an Auxiliary Power Token while three-pointer Thrusters lets you improve a revealed green manoeuvre by one speed point although it is a single use card. Being low cost these two will be tempting but you only have three slots to fill (two if you go for the generic squadron which costs just 20 points instead of 24). At four points, Support Ship is your lifeline and definitely one to equip as it gives you a "last stand" option instead of destroying your final Squadron Token. Cover Fire allows you to increase the number of defence dice by the total of your primary weapon value and Cloaked Fighters does exactly what it suggests by name but does restrict your fighters to a speed of one. 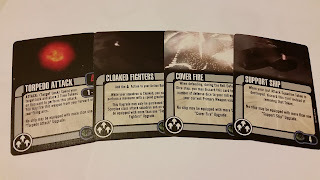 What I appreciate about these four point upgrades is that there are no discard or disable restrictions meaning they can be used again and again and enhance your fighters for the long term rather than a single hit. 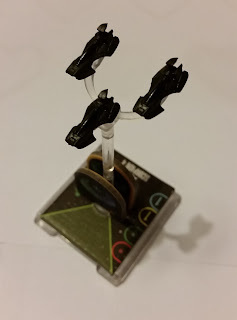 It's one more thing that distinguishes the fighter squadrons from regular ships and has made them enticing for players to use. The final four point card offers Torpedo Attack at ranges one and two. Upping the attack potential to four dice it can be fired forward or aft and does incur the use of Time Tokens to reactivate the feature. Certainly a reduced power photon torpedo this doesn't allow for any results to be converted for additional damage. 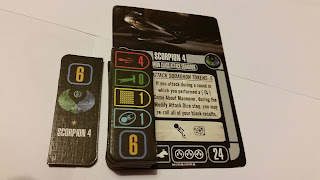 The final two cards from the Scorpion 4 expansion are five point blinders to deal that extra bit of damage on your probably larger opponent. 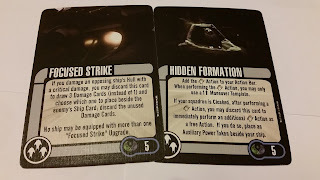 Focused Strike is a classic allowing you to discard the upgrade to draw three damage cards on inflicting critical damage and pick which one of those you wish to hand to your opponent. 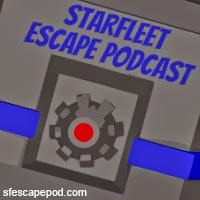 A nice opportunity to pick the worst eventuality and hinder that Klingon fleet a little more. 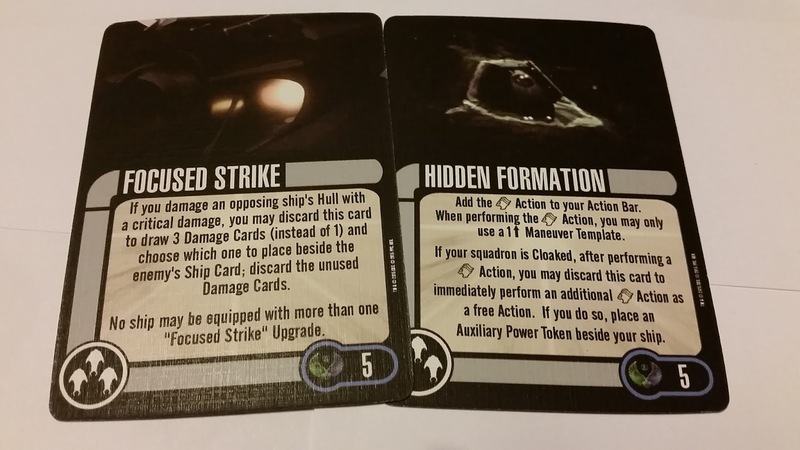 The final card is Hidden Formation which works in conjunction with Cloaked Fighters. Adding the Sensor Echo feature to the squadron it does limit you to only side-sliding by speed one rather than a maximum of two. It can either be retained and used as a standard Sensor Echo or handed in to perform a second Sensor Echo as a free action. It gives you options if nothing else but there is a sense that some of the actions here would be standard on ships of the same point value and you could end up using a lot of points just to ensure you have the core basics provisioned on the squadron. There are a couple of nice options but outside of Focused Strike and Cover Fire you are plumbing in "normal" extras. One good point though - the pack mission is 100% original. Advanced Assault creates a Dominion War scenario instead of playing out something linked to Nemesis and has the fighters accompanied by another Romulan vessel taking on three Jem'Hadar ships with the ultimate aim to deploy your forces to a planet to counter an invasion. 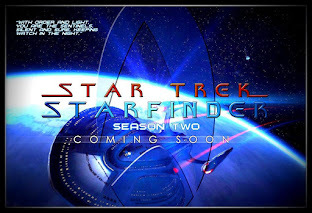 Please, please let this and the mission from the Kazon ship show that the upcoming waves will have unique missions to play through rather than episode retreads and that we might get some more single player options too. Of the three it's the fighters which are my personal choice this time round adding another dimension to the Romulans and something out of the ordinary series of large class ships that tend to fill out each wave. Talking of upcoming waves actually there were some announcements over the festive period indicating that we will be seeing a 25th, 26th and 27th waves (pics at bottom) and one other item at minimum. 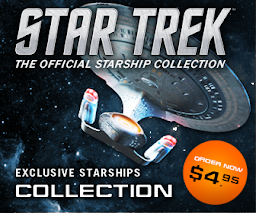 Wave 25 includes the Romulan D-7 IRW Algeron, the Klingon Vor'Cha Class IKS Devona and the teeny Federation Type-7 shuttle Einstein. 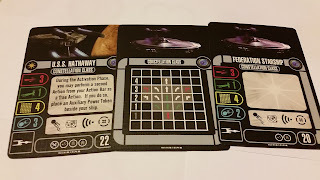 Wave 26 will offer the first new retail Galaxy Class starship since the starter pack with the USS Venture along with a new Borg Assimiliator 87 (same design as the ship from Descent) and Attack Wing's first Xindi ship, the Reptilian Warship. 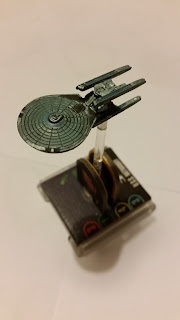 Finally with Wave 27 there will be the Oberth Class USS Yosemite, a third Valdore Class warbird with the IRW Jolan-Tru and the Xindi Aquatic Shp Calindra. 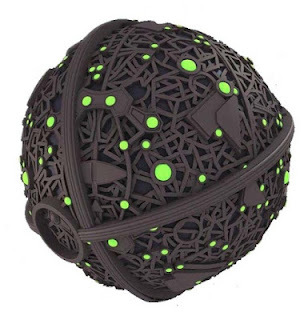 Perhaps the most exciting thing for Attack Wing in 2016 though will be the Weapon Zero Xindi sphere which will be debuting in the next few months. According to the information that is so far available it will be larger than the Borg Tactical Cube but smaller than the oversize Borg cube, measuring out at around four inches in diameter. 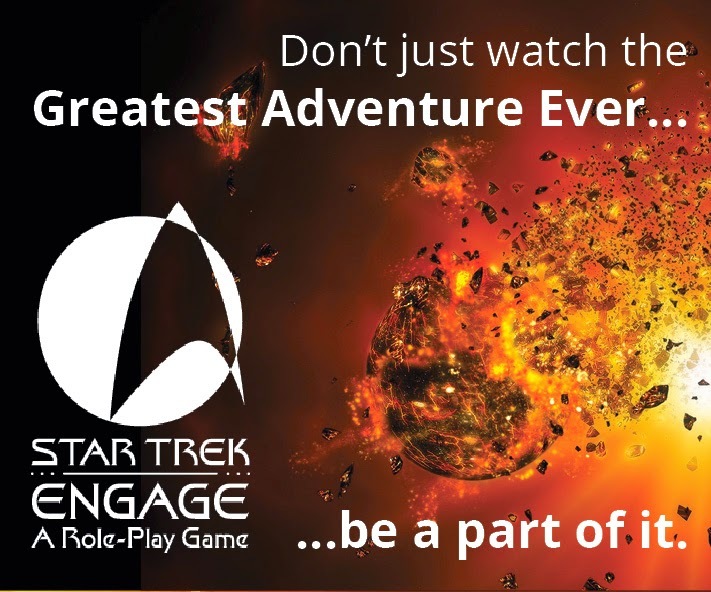 It will be the most powerful game piece from the Enterprise era by far although how anything from that period will be able to stop it is another thing. Which are you looking forward to adding and which are worth avoiding? Are you planning on adding Weapon Zero?